During December 2012 we left town for about a month. Prior to our leaving I noticed a little water that had been appearing under the gas water heater. The water heater was about 15 years old, longer than it should of lasted, so I strongly expected it needed to be replaced. I did not have time to deal with it at that moment. So before leaving town, I turned the hot water heater to the vacation setting AND turned off the main water supply to the house. I figured if it burst while we were gone, the only water we would deal with would be the contents of the water heater. We were also leaving during the winter months and I wanted the water off in case there were any deep freezes like El Paso had in February of 2011. Fast forward one month.....we return home in January of 2013, the first thing I did upon entering the house was to go downstairs and check the water heater. It was fine, with a few drops of water. I then looked at the laundry room wall which looked a little bowed out. I then slid the dryer out of the way to look at the floor. Sure enough there was water on the floor. But where did it come from? Since it was not the water heater, it had to be somewhere upstairs. I then walked into the main floor bathroom which has a wall that is shared with the downstairs laundry room. I felt the damp carpet as soon as I stepped in. I opened up the under sink cabinet door. Sure enough there was a leak under the sink that was not there when we had left. I turned off the valves underneath the sink. Now remember, I turned off the main water supply valve at the street. So how did the water leak you ask? Well evidently, even when the water was turned off all the way, it was not actually turned off all the way. Grrrrr. I did contact the water company in El Paso to come and fix this since this was their equipment. And they did. 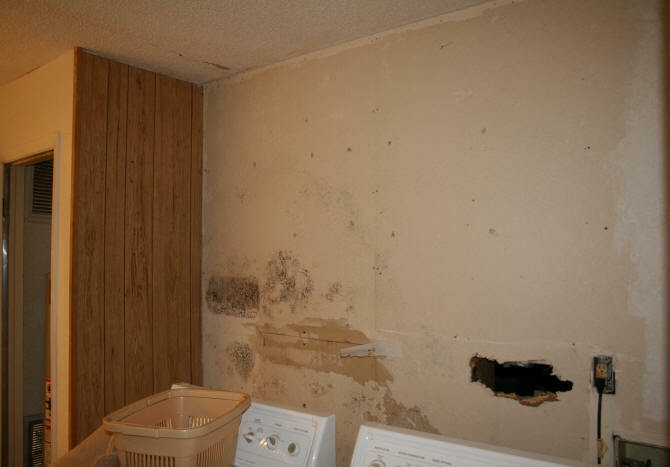 It did not change the fact that I now had water damage in the main floor bath and the laundry room wall below. We are fortunate that the main water valve was "almost" off. If we had left it on full, there would have been flooding on the entire main floor and lower level of the house. Major water damage with the house being unfit to live in, until the damage was repaired. Not to mention a huge water bill. Fortunately this was something that was covered by our home owners insurance and I contacted our insurance company to open a claim. The first part of fixing this damage was to get a plumber in to fix the leak under the sink. Then the water remediation process began. The company that did this ripped out the carpeting in the bathroom and the outside wall and paneling in the laundry room, leaving the old drywall up temporarily. On the other side of the laundry room wall, is the under house crawl space. Large fans were plugged in and placed under the house, in the laundry room, and the main floor bathroom. All in attempt to dry out the wood. This went on for a couple of weeks until everything was dried out. 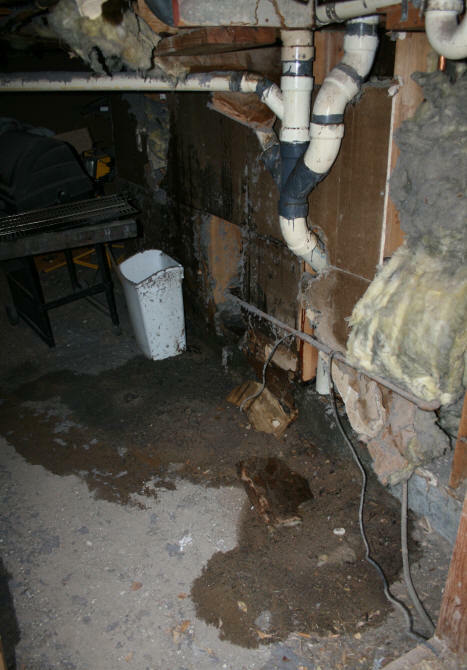 During the water remediation process another contractor, sent by the insurance company came out to do the estimates on the bathroom, laundry room, and outer wall damage in the crawl space. The plans for demolition began. The photograph to the left is the photograph I took in the crawl space. Yes, the crawl space for this house is nasty. The wall you are looking at with all of the thick pvc sewage pipes, is the other side of the laundry room. 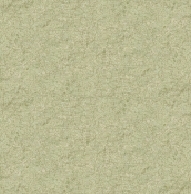 There is some type of outdoor drywall material on the outside. Insulation, then the drywall in the laundry room which is covered by paneling. Most of the fuzzy stuff is dryer lint or insulation. The bottom of the crawl space is dirt. This was the last spot for the water to go. 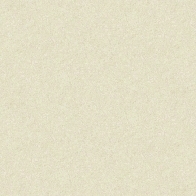 The photo below shows the ceiling of the crawl space which is the floor in the main bathroom that was wet. There is normally insulation stuck on here but I pulled it down before I took the picture. The photo below shows a section of the floor behind the dryer that I discovered was wet. One of the bulges or warps of the paneling can be seen by the gas valve. You can see where the moulding is wet along the floor along with the towel I threw on the floor. 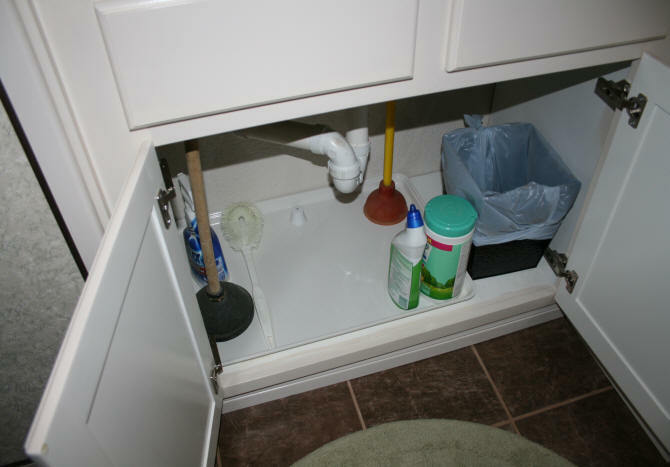 Above is a picture of the bathroom cabinet where the sink was leaking. I had thrown a bunch of old towels in to soak up the water. My old friend WD-40 helped me turn the water valves off by loosening the tight valves. 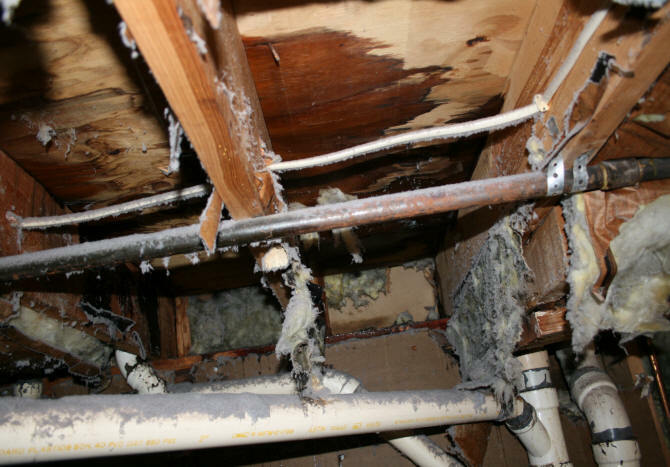 If the bathroom cabinet looks pretty ugly without water damage, you are correct. This bathroom was the first thing on my list to re-model after I finished the lower floor. 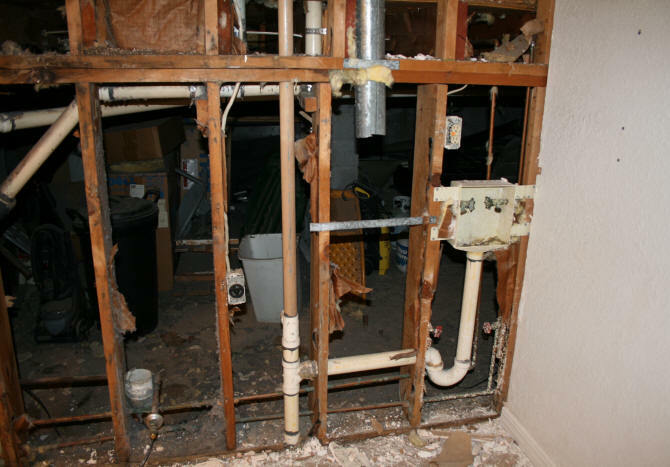 The main bathroom repair and remodel will be covered on a separate page because the project became a little more involved than just repairing the water damage. The photo above shows the laundry room after the paneling was removed. The drywall was all there was, between the exposed crawl space behind it. I asked the contractors to leave the drywall up until they were ready to take it off. It was the dead of winter at this point and it was cold. After seeing this drywall, I was sooooo glad I had opted to keep the paneling on in the man cave and just cover it with the wallpaper. The water heater closet is shown in the left in the photo above. Yes, the water heater was replaced when the plumber came in to repair the damaging leak. I asked the contractors to work on the laundry room wall first because of the cold. I wanted to have the room sealed off as soon as possible before they started on the bathroom upstairs. 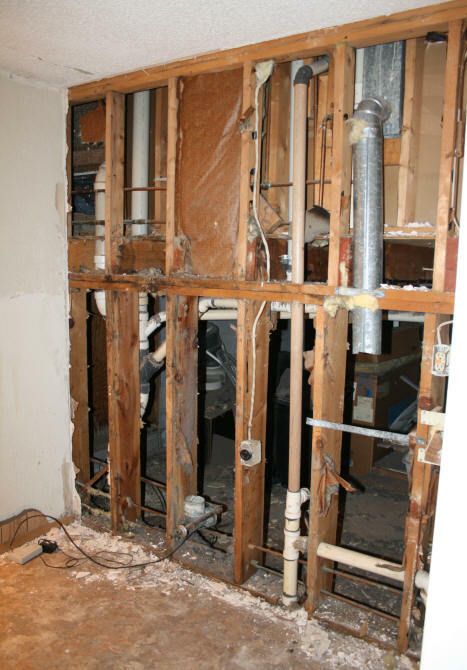 The photo above and below shows the laundry room wall after the drywall was removed. They also removed the paneling on the side of the water heater closet. The drywall on the water heater closet wall was not damaged, so it stayed on. 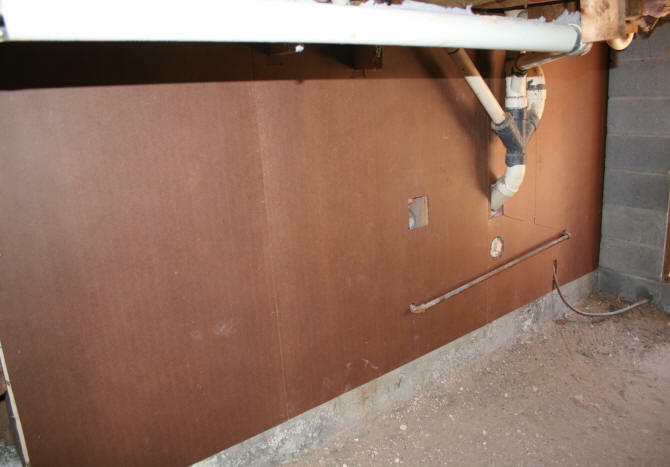 The photo below shows the outside crawl space wall after the repairs were done. 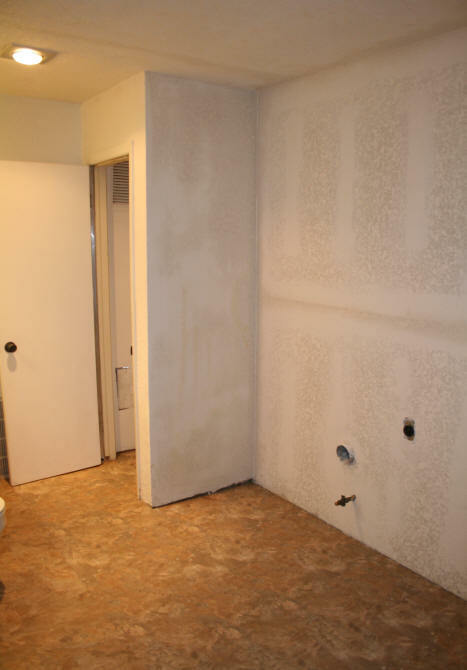 The photo on the left shows the laundry room after the drywall was replaced, the popcorn texture removed from the ceiling, and the new texture placed on the drywall and ceiling. I replaced some of the floor tiles that were water damaged with some extra tiles I had left over from when I had re-tiled the lower floor less than a year before. 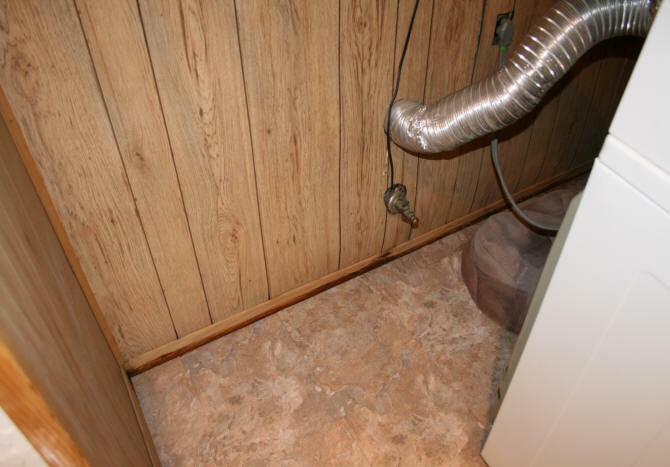 In the water heater closet, there was only cement on the floor. I added two layers of tile to make it level with the rest of the floor before the contractor put the new water heater back in. I placed new moulding along the floor and painted the entire room. There were wire shelves above the washer and dryer before the walls were torn down. My next project was to build cabinets along the wall. I moved the wire shelves to the garage and mounted them in there. One thing I was absolutely paranoid about, at this point, was the possibility of any future leaks and water damage in the house. There are a total of four sinks with the plumbing hidden under cabinets. The three toilets, hot water heater, and the washing machine. All potential leak risks. I went online looking for some type of alarm that could warn me about a water leak BEFORE it caused a lot of damage. I found these tiny alarms on the Improvements website for about $20 for a set of 3. They are tiny, but they work! They are powered by a non-replaceable battery. The expiration date is stamped on the bottom. The sets I purchased in February 2013 expire 6/2015. When they expire or the battery dies, you just buy more. They are easy to test by setting them on a wet paper towel. 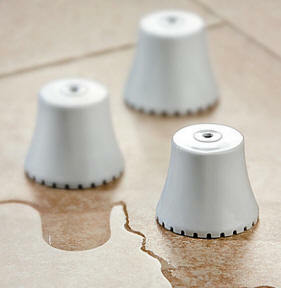 It only takes a little bit of water or a damp floor to set them off. It is a high pitched tone that is easy to hear if you are in the room. If the alarm is down in a basement that is rarely visited, you may not hear the alarm. I bought enough sets to place these alarms at every point water enters the house. They have already helped me discover a small leak I did not know I had under my kitchen sink. I did not stop with the alarms. Under the sinks I wanted to also stop water damage before the water even touched the wood on the cabinets. So I looked for large fiberglass trays that would cover most of the area under the sinks. I found the trays on the Global Industrial website. I bought trays to go under each sink in the house. 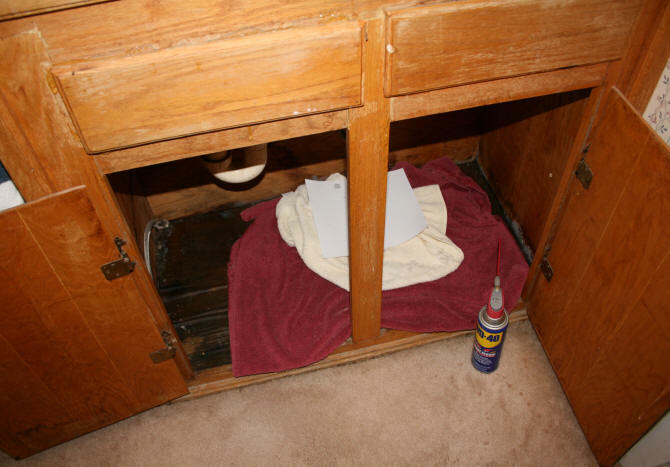 Below is a photograph of a fiberglass tray and alarm under the main bathroom sink. So now if there is a leak, the water will hit the tray first and the alarm will go off.